We have recently completed our second workshop series. 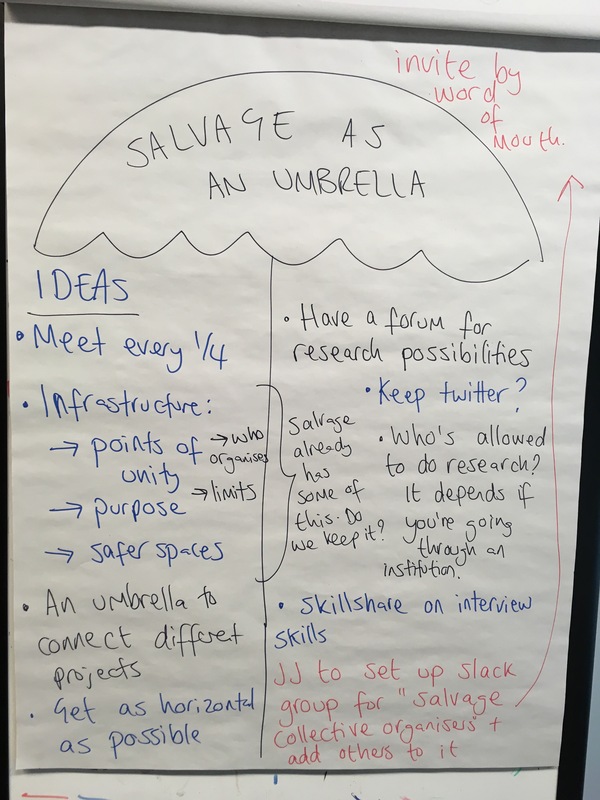 This workshop series culminated in a strategy day, so if you want to hear about what is going on with the salvage collective and how to get involved check out the round-up below. Thanks to all those who took part, facilitated, cooked food, hosted us, gave us money and did the important hidden and invisible support work that enabled this workshop series to happen. Special thanks to Babs, The Collective Liberation Project, The Common House, Food Not Bombs, Hannah Lewis, Jacqui Gabb, Junction 3 library, Kathryn Tulip, Molly Carroll, Navigate, Nate Eisenstadt and The Open University. The key purpose of the second ‘capacity-building’ workshop series was to support and strengthen a network of activists engaged in the production of sustainable and effective practical interventions that address ongoing barriers to inclusive social justice movement building. We learned from our first research project and workshop series with activists across the UK that there was a need for people involved in safer spaces, accountability and consent activism to come together to meet and support each other as well as learn, discuss and share skills, ideas and experiences. This second ‘capacity-building’ workshop series was funded by The Open University as part of the Citizenship and Governance strategic research area. This meant the workshops were free to attend as we could use the money to cover all the costs of the workshops including facilitators, everyone’s travel costs, venues, food and refreshments. We identified four key areas of need: challenging white supremacy and learning about non-oppressive practice; sharing and developing our workshop facilitation skills; avoiding burnout and learning about how to make our activism more sustainable; and strategizing about how to develop and support our work in the future. In the morning session Katie (The Collective Liberation Project) took us through a series of exercises to explore white supremacy and how it shows up in our lives and activist spaces. We explored our emotions and the weight of silence around discussing race within our lives. In this we looked at the characteristics of whiteness, white fragility and white gaze. This allowed us to discuss allyship as an active, consistent and uncomfortable practice of solidarity. *I have since found this article useful in helping to identify how white supremacy culture shows up in activist spaces and gives some ideas on how to challenge it. It was most likely Katie who pointed me towards this! In the afternoon, Nate (Eco Dharma and Kebele) took us through some of the basics of non-violent communication and we explored our own responses and defenses to being challenged. We did some small group work with scenarios to think through how to put non-violent communication into practice as well as thinking through some of its barriers and limitations. We talked about what our next steps could be including affinity groups, staying in touch with others in the group, finding 1-2 other white people to share/learn with, and Katie mentioned the Whiteness Learning Facebook Group. Hannah (Navigate) was such a great facilitator. I learned a lot by just watching her facilitate the day. She did some great things like modelling what activities to do if people were late (on activist time), was welcoming, expressed warmth and validated the experience in the room, invited all the parts of people into the room including worries, anxieties and acknowledged our sensitivity and vulnerabilities. We had a lot of discussion on the question ‘what is going to support you to be more safe today’ individually, in small groups and as a whole group to create a ‘feeling safer together’ flipchart. Then we reflected on what it was like to have this discussion and came up with some really good ideas about ways to support discussion about safer spaces especially in relation to our experiences in activist spaces so far. Then we did a small group activity in which we shared our most challenging and difficult experiences as a workshop facilitator. We then chose one scenario to act out with the rest of the group and from that chose one scenario to problem-solve. Hannah had a table with lots of resources on workshop facilitation from Training For Change. Molly and Kathryn (Navigate) took us through some activities to explore our burnout and identify the factors/context that leads to our burnout. We discussed the external messages we get about work and how this feeds into some of the problems we see in activist culture – as task-focused, unable to deal with conflict, reluctance to talk about emotions, needing to work to prove you are an activist etc. We talked about how these messages are related to neoliberalism, victim-blaming, ableism, capitalism, patriarchy/misogyny. We also looked at what sustains us and how to nurture resilience and well-being across 6 areas: giving; creativity; physical activity, connecting to others, developing awareness, learning new things. We also talked about the self-care practices we have seen work in our groups. We then worked on two questions in relation to our current activism/or activism we are thinking about getting involved in: 1. What support do I need from the group to do this work sustainably? 2. What can I give to the group that would contribute to a supportive culture? We also spent some time setting our own boundaries and exploring how it can be difficult to maintain our boundaries e.g. if they aren’t respected, you find them hard to make, if people are in crisis, if you feel pressure to be nice. e.g. well-being checklist; checkouts (how you feel about how much you spoke whether you would have spoken more if you had the opportunity, if you listened, if you felt listened to or felt talked over); ways to keep a safer spaces policy active and alive; have a frustrations section to air and be accountable to each other about issues before it gets bad; have a strategy day to review safer spaces policy or say it out loud at the beginning of every meeting; to balance gender check outs for women and non-binary people to be a brag about an accomplishment and for cis men to check out with an emotion/feeling; learn about non-violent communication; co-counselling (spaces for active listening, asking question, contained venting spaces), ambush training (doing training on self-care within a meeting with no prior warning), create a process to distribute labour with realistic timescales and making sure it is ok to revisit workload if it is not sustainable and change plans; learning about project management skills; having back to basics meetings (reviewing who does what, think about roles changing), written resources, mentors. In the afternoon we thought creatively about possible actions for how to take this work forward given our capacity, need for self-care and boundaries. This involved lots of ideas bouncing about including a co-counselling network, a network of workshop facilitators, ways to prioritize what events to do, transformative justice camp, work with abusers, spaces for information sharing (especially legal ramifications), craftivism, a comedy night, apologist bingo, flyers to amplify lived experiences of marginalised survivors, podcasts, video, following @deadbeatpunkboyfriend on Instagram. Hannah facilitated us down to what was possible/workable. 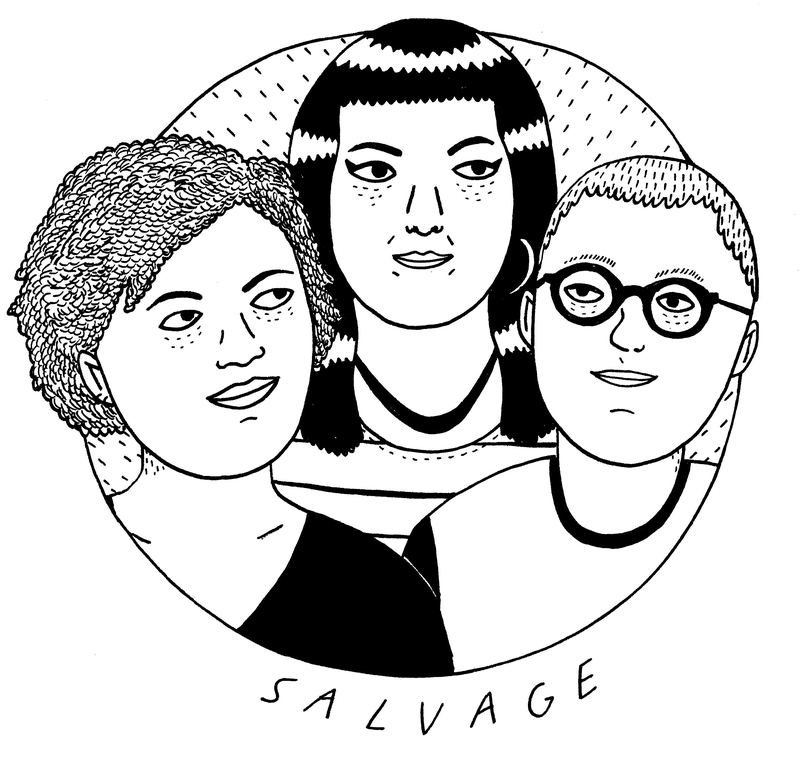 Here the idea of the Salvage Collective becoming an umbrella collective. For us, this looks like a loose network which can link up individuals, groups and campaigns that could connect/support each other doing work around sexual violence. It was decided to aim for quarterly events in different places and start work on the infrastructure (e.g. points of unity and safer spaces). We are currently working on the first salvage collective forum event to be held on Saturday 23rd September in Sheffield at the Quaker Meeting House. The Salvage Collective Forum will hold space to share our skills, challenges and experiences, to listen and discuss ideas with each other and invited speakers, and develop survivor-centred ways to resist and respond to harm, violence and abuse in our communities. We are inviting grassroots groups and collectives already working on or who are interested in challenging gendered oppression, violence and harm that happens within our communities to participate. This can involve groups, campaigns and collectives who are involved in safer spaces work, accountability processes, survivor-led projects or consent activism (and much more). The aim of the Forum is to link up as many of our groups as possible in order to share and learn from each other. Would you like to deliver a presentation about your organisation and the work you do? Would you like to facilitate a skill-share session? Would you like to attend the event to learn about anything specific? Are you interested in hosting a future forum in your area?